Sola Sisters: An Interview About Rob Bell's Book "Love Wins"
Thank you to my friend Andy Olson of Echo Zoe Radio for having me on his show again recently. We did this program as something of a follow-up to our first talk, which was about my background as a New Ager, and how, as a born again believer in Christ, I had slowly come to realize that many of the same New Age practices and beliefs that I had once held to as a Universalist New Ager were now flowing into the church, of all places. As providence would have it, shortly after this first interview, Rob Bell, who is a very popular author, pastor and leader in the rapidly growing Emergent Church Movement, released a controversial new book entitled "Love Wins." In one interview about this book, Bell made the claim that his book was the beginning of a new reformation "of thought" that is coming into today's church. But the "Reformation" that Rob Bell wants to bring into the church is away from biblical truth, and toward an easygoing all inclusiveness, with nothing of the biblical concepts of the narrow path (Matthew 7:13) and the exclusivity of Christ (John 14:6). In fact, my view is that Rob Bell, either knowingly or unknowingly, is working as a kind of "change agent" from within the church to bring his beliefs about Universal Salvation (which is the core theology of the New Age Movement) into the church. ➤ The origins of Universalism and a brief history of both Universalism and a very popular new movement among churchgoing youth today that is known as "Christian Universalism." ➤ The rise of Universalism in the 19th Century, influenced heavily by the German philosophers of the day. ➤ The rise of the “Seeker Sensitive” movement as a reaction to the perceived problems with “fundamentalism” and Conservative Christianity. ➤ The influence of Rob Bell on today’s Church, especially among youth. ➤ The promotional video released by Rob Bell for his new book, and how it provocatively hinted at his belief in Universal Salvation for all......even though he and his supporters loudly protested to the contrary. ➤ The influence of mysticism, the monastic “Desert Fathers” and “Contemplative Prayer” on Rob Bell. 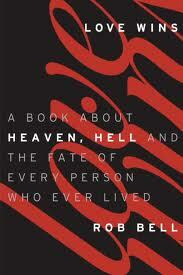 ➤ Rob Bell’s response to his critics. We played the audio of Rob Bell giving an orthodox sounding pseudo-creed that uses Christian terms, but which carries redefined meaning. We concluded our discussion of Rob Bell by emphasizing the importance of good teaching, and listed several good ministries that we can recommend. The Echo Zoe interview can be listened to in its entirety here.